I needed a new staircase rail set after replacing front walk up staircase and garden beds with Techo-Bloc stone. 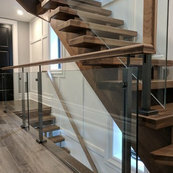 Found Omega on the internet and am very happy with their work and metal stair rails. They responded to my e-mails promptly and I have no problems recommending them. The new metal rails finished our landscaping off perfectly. Measuring and installation was excellent.